A pair of socks embedded with miniaturized microbial fuel cells and fueled with urine pumped by the wearer's footsteps has powered a wireless transmitter to send a signal to a PC., the first self-sufficient system powered by a wearable energy generator based on microbial fuel cell technology. Microbial fuel cells use bacteria to generate electricity from waste fluids. They tap into the biochemical energy used for microbial growth and convert it directly into electricity. This technology can use any form of organic waste and turn it into useful energy without relying on fossil fuels, making this a valuable green technology. Ieropoulos says, "Having already powered a mobile phone with MFCs using urine as fuel, we wanted to see if we could replicate this success in wearable technology. We also wanted the system to be entirely self-sufficient, running only on human power - using urine as fuel and the action of the foot as the pump. This work opens up possibilities of using waste for powering portable and wearable electronics. For example, recent research shows it should be possible to develop a system based on wearable MFC technology to transmit a person's coordinates in an emergency situation. At the same time this would indicate proof of life since the device will only work if the operator's urine fuels the MFCs." 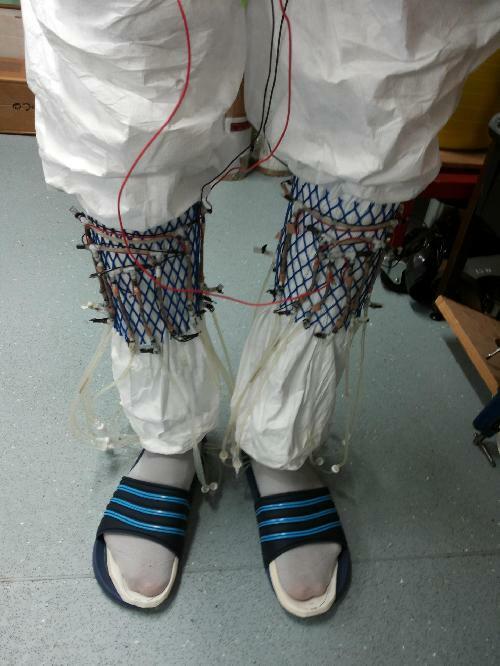 Article: 'Self-sufficient Wireless Transmitter Powered by Foot-pumped Urine Operating Wearable MFC' published in Bioinspiration and Biomimetics.